Located in Hickory, North Carolina, SSA is the preeminent supplier of superabsorbent polymers (SAP) to the North American wire and cable market. 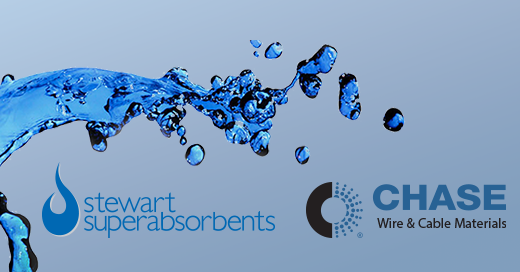 Additionally, Stewart provides technical support for research, development, design, testing, and product implementation to both end users and component suppliers that want to add superabsorbent functionality to their products. SSA has an established history of providing outstanding customer support to all supply partners. We react quickly to changing customer requirements while supplying customized value-add solutions. Established in 1946, Chase Corporation is proud to serve a global customer base, making a material difference every day among industrial and consumer sectors across a diverse range of markets. Chase is the home of trusted high-quality, high-performance tapes and sealants used to insulate, bind, waterblock and shield both energy and communication cables. and water blocking tapes, strandfill compounds and superabsorbent polymers. For more information on any of these materials please contact us.